The Wyss Institute has been awarded up to $900,000 from the Defense Advanced Research Projects Agency (DARPA) to further develop tools for improving the reliability and efficiency with which living cells are transformed into microbial manufacturing facilities for high-value commodity chemicals, such as biofuels and drugs. Living cell factories have the potential to become sustainable alternatives to the chemical processes often used to produce carbon-based compounds. But issues of efficiency, reliability, and cost have prevented their wide-scale adoption. The new approach could represent a significant step toward overcoming these obstacles. The state-of-the-art tools under development will enable the assembly of 3D materials and nanostructures that use nucleic acid-based circuit boards with proteins. The proposed tools would use nucleic acids as “building blocks” that assemble themselves into nanoscale scaffolding inside the cell to control its internal architecture and components. Such structures could be programmed to trigger the enzymatic reactions needed to make the cell produce a specific commodity. The enzymes in a cell typically wander freely throughout the cytoplasm until they find each other and catalyze a chemical reaction. 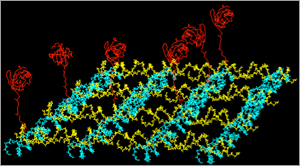 Under the new approach, the cell’s enzymes would adhere directly to the nanoscaffolding where their close proximity would accelerate the pace of reactions. These speed gains could ultimately drive down production costs. Moreover, the tools would be applicable to a wide range of chemical production needs — from biofuels and drugs, to sugars and biodegradable plastics. The overall approach was developed by Wyss Core Faculty member Pam Silver, Ph.D., and she will be principal investigator of this two-and-a-half-year DARPA project. Silver is also a Professor of Systems Biology at Harvard Medical School and the first Director of Harvard’s program in Systems Biology. Wyss core faculty members James Collins, Ph.D., and Peng Yin, Ph.D. will serve as co-principal investigators. Collins is also a Professor of Biomedical Engineering at Boston University and a Howard Hughes Medical Institute Investigator. Yin is also an Assistant Professor of Systems Biology at Harvard Medical School. The award is part of DARPA’s Living Foundries Program, which was launched last year to develop novel biological production systems that will provide the nation with entirely new manufacturing capabilities.